As an experienced nondestructive testing lab, Jesse Garant Metrology Center understands the often demanding requirements for composite inspection. We’ve inspected a wide range of parts for various industries, validating complex dimensions and identifying defects in a variety of composites. We provide critical inspection data at all stages of composites manufacturing with a full suite of advanced imaging options. We’re equipped with the greatest diversity of industrial computed tomography systems in North America, including an exclusive high-energy CT system for rapid mid-size part inspection. We also have a host of systems for radiographic testing and 3D scanning to provide even more imaging options. With multiple NDT systems, we inspect a wide variety of composite parts of different sizes, shapes, and materials for industries like aerospace, space, oil and gas, and automotive. These include lightweight graphite engine blocks, springs, structural chassis components, multi-part plastic assemblies in medical devices, glass fiber turbine blades, and woven carbon fiber pipes. Our reliable inspection process is customized to client needs and provides unbiased data from design and pre-production to failure analysis and lot inspection. Our industrial CT services are highly applicable for internal nondestructive testing of preliminary composite parts and materials. They ensure the consistency of first run parts by checking for features like porosity, wall thicknesses, and out of place fibers. We also verify internal dimensions and validate fit and function for satisfying First Article Inspection requirements. To validate external dimensions, 3D scanning is another option. Ensuring that production processes are operating optimally can be a daunting task for manufacturers. Offline production inspection with industrial CT can streamline the process, providing critical data for 100% inspection at specific intervals. This confirms that quality standards are met before parts reach their final destination. Our industrial x-ray services are highly suitable for large volume part sorting of composite parts, taking the guesswork out of quarantined, warranty, and recalled parts. We provide an inspection process that’s traceable and repeatable, isolating suspect parts from an otherwise good lot. For lower volume part sorting, industrial CT is another option. 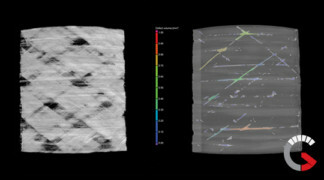 For identifying and characterizing the whole range of composite defects, industrial computed tomography is the optimal nondestructive testing method. Our industrial CT services reveal external and internal defects in great detail, including delaminations during curing, debonding, porosity, inconsistent wall thicknesses, fiber weaves, and structural deformations.